Our front porch has been host to some shiny black Virginia carpenter bees. Earlier this year a couple females chewed burrows in the woodwork in which to store pollen and lay eggs. 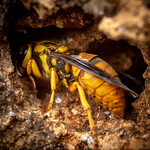 I had been keeping my eye on the nests to see if I might be able to catch an emerging young bee. This afternoon, however, I found something even more interesting. Behold! A carpenter bee nest entrance (lower left) shows signs of activity, but what emerged from pupation were not bees but parasitic Xenox tigrinus flies that had, as maggots, consumed the developing larvae. A Xenox tigrinus bee fly must have been successful in breaching a carpenter bee’s defenses. Death by parasite is the unfortunate fate of many insects, and bee flies inflict their share of damage on solitary bees whose nests are inadequately protected. Below are a few more photos of the Xenox flies. The patterned wings of Xenox tigrinus are unmistakable. The flies let me approach closely while their cuticles hardened. Wow! They must be pretty big! Thanks for this post, and thanks to May B. for flagging it on Facebook. I live in northern Virginia, and Virginia carpenter bees are my least favorite pollinator, making holes in my home’s eaves and deck with annoying regularity. In the last week or two I saw one of the Xenox flies but didn’t know its name or M.O. Now I do. I watched carpenter bees aerially defending territory (or defending something) once. They hang mid-air in one spot and then when another comes near, there is an aerial tumble/fight. They did it all day long. I had no way of knowing if it was about mating or if it was male-to-male aggression but it was really amusing. 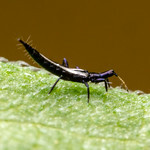 I read this blog yesterday and then saw this exact insect at the park in Champaign today. These images are stunning. I haven’t seen Carpenter bees like these before. Little-known tidbit on this fly. When I described the genus Xenox, I originally had intended Xerox. I gave my hand-written MS to a typist (I had one way back then!) and she mistook the “r” for an ‘n”. I got the typed paper back — and thought a bit — and decided Xenox would indeed be less of a pain to deal with regarding potential negative repercussions with the Xerox company. And so it is Xenox instead of Xerox. Really? That’s a fantastic story, though it’s a little sad that Xerox doesn’t get to be a genus.